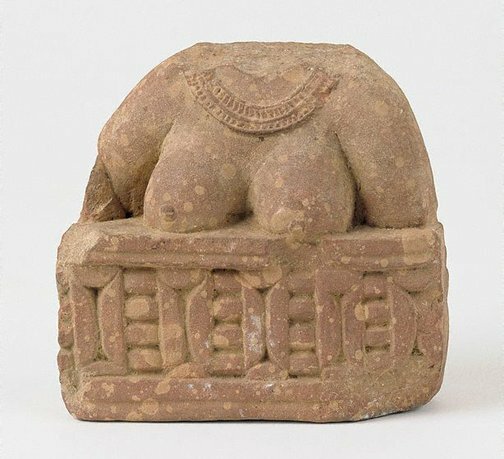 This fragment is a lovely example of the distinctive Mathuran style of sculpture, fashioned from the mottled red sandstone unique to that site. It depicts the stylised yet ample breasts, the patterned collar and the rounded shoulders of a woman who is shown leaning over a balcony. As more complete examples of this type of image suggest, this leaning female figure would have probably been accompanied by a male consort. Such images decorated the upper portions of the railing pillars of Mathuran stupas. The images usually convey a convivial mood, often depicting amorous couples and drinking scenes.